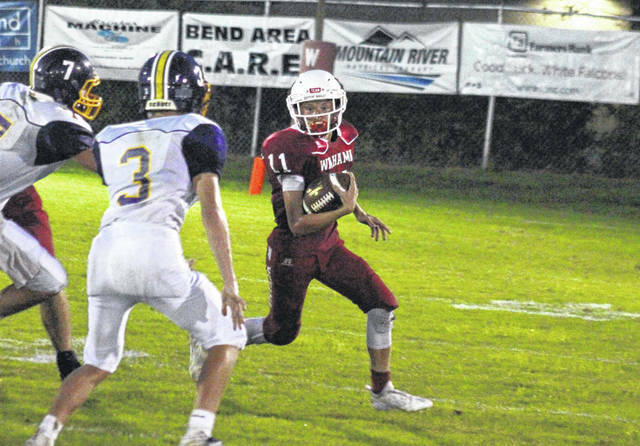 Southern senior Alex VanMeter returns a White Falcon fumble 40 yards for a touchdown, during the Tornadoes’ 43-0 victory on Friday in Mason, W.Va.
MASON, W.Va. — Most offenses are happy to get a first down every three plays, but not the Tornadoes. In the first half of Friday night’s Tri-Valley Conference Hocking Division football game at Bachtel Stadium, the Southern offense averaged a touchdown every three plays, and with the SHS defense and special teams units throwing in a touchdown apiece, the Purple and Gold rolled to a 43-0 victory over Wahama. 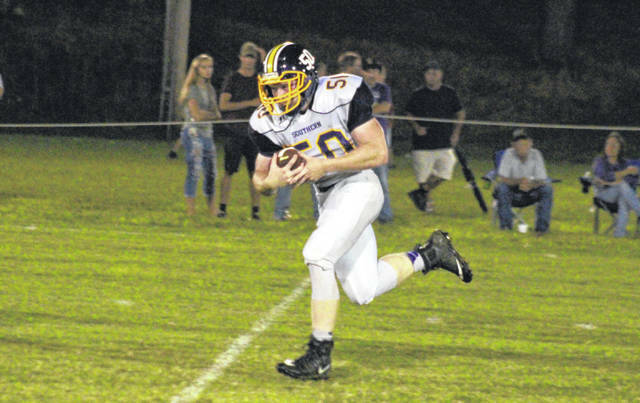 Southern (3-0, 2-0 TVC Hocking) forced the White Falcons (0-3, 0-2) into a three-and-out in the game’s opening possession and at the 7:53 mark of the first quarter, the Tornadoes broke the scoreless tie. SHS junior Trey McNickle capped off a five-play, 40-yard drive with a six-yard scoring run, which was followed by a successful extra-point kick by Logan Drummer. The White Falcons also went three-and-out on their second drive, and this time Southern senior Austin Arnold blocked the punt to give the Tornado offense possession at the WHS 41. On the ensuing SHS drive Drummer, the quarterback, caught a 27-yard pass from wide receiver Weston Thorla on the initial play, and then the Tornado signal caller ran 17 yards for the touchdown on the following play. The point-after kick was wide right, but Southern still led 13-0 with 5:33 left in the first quarter. 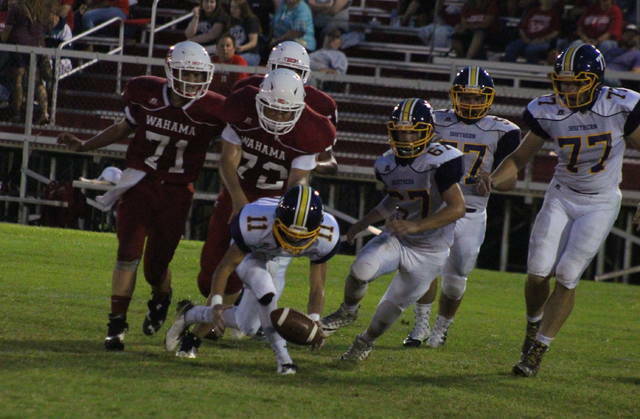 Wahama suffered a third straight three-and-out, and Arnold once again blocked the WHS punt. This time, Thorla scooped up the blocked punt and returned it 20 yards for a touchdown. Drummer ran in the two-point conversion, giving Southern a 21-0 edge with 3:09 to go in the first. The White Falcons picked up their first first down on their next possession, but was forced to punt with 16 seconds left in the period. The Tornadoes fumbled the ball twice on their next drive, but recovered both times and went ahead 28-0 as Drummer scored on a 17-yard run and then kicked in the extra-point. A three-and-out by the Wahama offense and a short punt gave the Tornadoes possession at the WHS 39. McNickle took the first down carry all the way to paydirt with 7:57 left in the half. After a holding penalty on the first two-point conversion try, Drummer tossed the ball to Gage Shuler, who found his way into the end zone to give SHS a 36-0 advantage. The WHS offense picked up two first downs on the ensuing drive, but fumbled the ball on its own 40. Southern senior Alex VanMeter scooped the loose ball and found his way to end zone with 5:17 left in the half. Drummer kicked in the extra point and gave Southern a 43-0 lead. 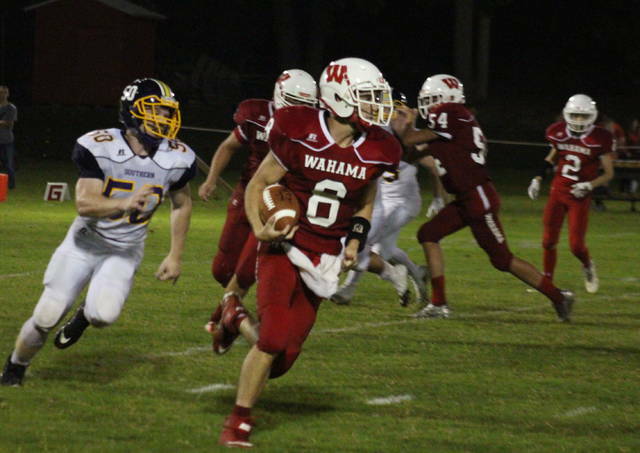 Wahama gained three first downs in the final drive of the first half, and the second half was trimmed to 20 minutes with a continually running clock. Southern ran just six offensive plays after the break, but never allowed Wahama to reach the red zone, sealing the 43-0 victory. Following the contest, first-year Tornadoes head coach Cassady Willford was pleased with his team in two of the three phases of the game. First-year White Falcons head coach James Toth acknowledged that he knew coming in what an up hill battle it’d be against the Purple and Gold. Southern picked up an 8-to-7 edge in first downs, and a 175-to-83 advantage in total offense, including 108-to-69 on the ground. SHS was penalized eight times for 85 yards, while WHS was sent back five times for 25. Drummer carried the ball three times for 26 yards and two touchdowns, caught one pass for 27 yards, and was 3-of-4 passing for 39 yards. McNickle scored on both of his carries, gaining 45 yards. Shuler caught two passes for 44 yards and added seven yards on a pair of carries, Thorla caught one four-yard pass and completed one 27-yard pass, while Austin Baker earned 17 yards on two carries. Reece Reuter carried the ball twice and gained three yards, while Brody Dutton hauled in one 12-yard pass. Leading the White Falcons, Brady Bumgrarner carried the ball 12 times for 44 yards and had the team’s only reception for 14 yards. Abram Pauley was 1-of-4 passing for 14 yards and added 23 yards on 10 carries. Brennan Grate carried the ball once for four yards, while Ronin Madill finished with five yards on two tries. Southern has now won four straight against Wahama and trails 32-5 in the all-time series. Willford noted how special it is for the Tornadoes to knock off the White Falcons, and also turned his attention to another set of Falcons. For Toth and the White Falcons, the next week will be about regrouping before Belpre visits Bachtel Stadium on Friday. This is the third consecutive season that Southern has began with a trio of wins, while its the second year in a row that Wahama has fell to 0-3 to start the campaign.